Hidden Creek Country Club’s Members enjoy casual and upscale dining options and a full social calendar filled with events and activities for all ages. The Roanoke Grill offers casual dining for the whole family and is open for breakfast (weekends), lunch and dinner and features a wide variety of seasonal menu selections. Members enjoy weekly specials including Half-Price Burgers, Kids’ Night and Prime Rib Night. The Tavern is the adult-only gathering spot for Members 21 years and older. It is the perfect place to relax with fellow Members and business colleagues at a private table or lounge in front of the fireplace on our comfortable couches. Enjoy exquisite views of the 15th hole from the Tavern’s adjacent outdoor deck, a favorite among our Members. 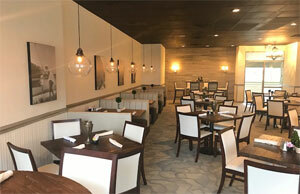 The Tavern offers full menu dining and great happy hour specials. 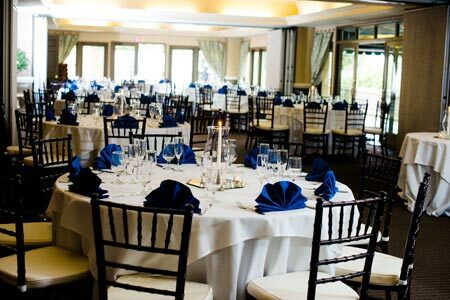 The Clubhouse features the elegant Fairway Ballroom which can accommodate up to 200 guests ~ the perfect venue for weddings, charity events, corporate meetings and more. 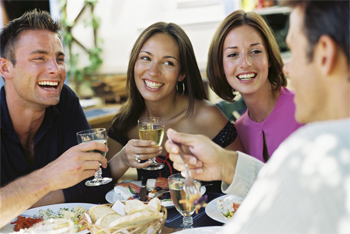 Members enjoy complimentary room rental for this venue (food and beverage minimums apply). The Fairway Ballroom is host to major Member events, including the festive Holiday Party and our famous Mother’s Day Brunch. Adjacent to the Fairway Ballroom is the popular all-season covered deck. With scenic views of the golf course, it is ideal setting for cocktail events, small gatherings and Deck Dining Night for our Members. This too is complimentary for Members hosting private events.